Neurenteric cysts are rare endodermally derived lesions. They are most commonly located within the spinal canal and are usually associated with bony malformations. Intracranial neurenteric cysts are rare and most are located in the midline posterior fossa. Uncommon locations include craniocervical region, cerebellopontine angle, fourth ventricle, and supratentorial parenchyma. ,,, Authors here report a rare case of neurenteric cyst located in the ventral cervicomedullary region which was excised via a lateral suboccipital approach. A 20-year-old male patient presented to our outpatient services with complaints of neck pain for 4 months and intermittent vomiting for 2 months duration. General physical examination was unremarkable. Neurological examination revealed left upper limb weakness (power 4+/5, Medical Research Council grading). Rest of the examination was normal. Gadolinium-enhanced magnetic resonance imaging (MRI) revealed a well-defined lobulated lesion in the ventral cervicomedullary region from medulla to upper border of C2 vertebra. The lesion was heterogeneous in appearance; the anterior part measured 2.8 × 1.6 cm and was hypointense and hyperintense on T1- and T2-weighted images, respectively; while the 1.7 × 1.1 cm sized posterior part was iso to mildly hyperintense on T1 and heterogeneously hyper intense on T2-weighted sequences [Figure 1]a and b. The anterior part of the lesion was isointense, whereas the posterior part was hyperintense on fluid attenuation and inversion recovery (FLAIR) sequences. There was mild restriction on diffusion-weighted sequences. On post-contrast study, rim enhancement was evident in the posterior part of the lesion [Figure 1]c. Preoperative diagnosis was neurenteric cyst. Surgery was performed in prone position. A midline suboccipital craniectomy (with bone removal more on left side), left-sided C1 posterior arch removal, and partial C2 hemilaminectomy were performed. Intraoperatively, there was a well-defined, intradural, extra-medullary encapsulated, relatively avascular, lobulated lesion containing easily suckable, cheesy material located anterior to medulla extending up to C2 vertebral level. Vertebral artery, lower cranial nerves, and posterior inferior cerebellar artery were well visualized and preserved. Tumor decompression was followed by near total excision of the cyst wall in view of adherence of the cyst wall focally to surrounding vital structures. Postoperative course was uneventful and he was discharged on 7 th postoperative day and is currently on regular follow-up. At the last follow-up of 3 months, patient was well with no deficits. Postoperative MRI showed a very small residual lesion [Figure 2]. Hematoxylin and eosin photomicrographs showed epithelial lining thrown into folds along with irregular bundles of collagen. Higher magnification images show a prominent columnar epithelial lining with goblet cells focally thrown into papillary formations (×100), pseudostratification, and absence of cilia (×400). Overall features were consistent with an endodermal (neurenteric) cyst of Hind-gut type [Figure 3]a and b.
Neurenteric cysts associated with the spinal cord are the most common and are typically situated in the ventral intradural extramedullary location in the lower cervical and thoracic spines. Approximately, 50% of them are associated with bony malformations including scoliosis, spina bifida, Klippel-Fiel syndrome, syringomyelia, and others. Intracranial neurenteric cysts are uncommon and very rarely they have been associated with bony malformations. The first case of intracranial neurenteric cyst was reported by Small (1962) and around 81 cases of intracranial neurenteric cysts have been reported in the literature since then. , Among these, the most common locations include midline posterior fossa, anterior to the brainstem which account for about two-third of cases. Craniocervical junction, cerebellopontine angle, cerebellum, and fourth ventricle are other reported locations in the posterior fossa. ,, Supratentorial location is, however, very rare. In a review of intracranial neurenteric cysts by Tucker et al. and Bejjani et al,  these lesions are known to occur in all ages, most commonly in the third and fourth decades. Most reported reviews show a slight male predilection but recently, report by Tucker et al. has shown equal male and female distribution. The presenting features depend upon the location of the cyst. Most patients present either with mass effects or with features of aseptic meningitis due to spill-over of cyst contents. , Major differential diagnosis at any site includes arachnoid cyst, dermoid cyst, and epidermoid cyst. Complete excision is the treatment of choice. Subtotal excision is advisable if the cyst wall is adhered to vital structures. Intracranial neurenteric cysts are rare, benign lesions of central nervous system. 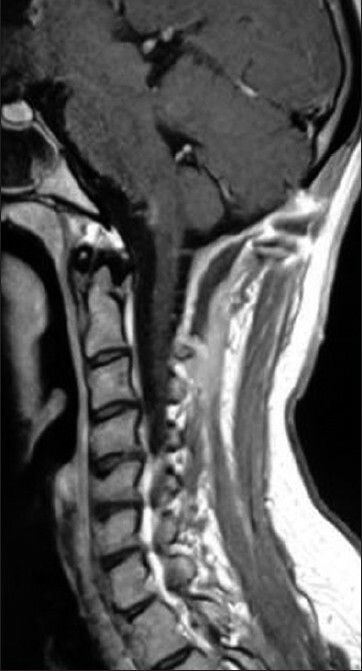 Craniocervical region is an uncommon location for neurenteric cyst. They need to be considered in the differential diagnoses when presented with the classical imaging appearance as described. Complete surgical resection is the treatment of choice. Subtotal excision is advisable in cases where cyst wall is adhered to the surrounding structures. Long-term follow-up is necessary to look for delayed recurrences. 1. de Oliveira RS, Cinalli G, Roujeau T, Sainte-Rose C, Pierre-Kahn A, Zerah M. Neurenteric cysts in children: 16 consecutive cases and review of literature. J Neurosurg 2005;103 Suppl 6:S512-23. 2. Tucker A, Miyake H, Tsuji M, Ukita T, Ito S, Matsuda N, et al. Neurenteric cyst of the lower clivus. Neurosurgery 2010;66:E224-5. 3. Filho FL, Tatagiba M, Carvalho GA, Weichhold W, Klekamp J, Samii M. Neurenteric cyst of the craniocervical junction. Report of three cases. J Neurosurg 2001;94:129-32. 4. Ito S, Fujiwara S, Mizoi K, Namiki T, Yosimoto T. Enterogenous cyst at the cerebellopontine angle: Case report. Surg Neurol 1992;37:366-70. 5. Yoshida K, Nakamura S, Tsubokawa T, Sasaki J, Shibuya T. Epithelial cyst of the fourth ventricle. Case report. J Neurosurg 1990;73:942-5. 6. Cheng JS, Cusick JF, Ho KC, Ulmer JL. Lateral supratentorial endodermal cyst: Case report and review of literature. Neurosurgery 2002;51:493-9. 7. Puusepp M. Variete rare de teratome sousdural de la region cervicale (intestinome): Quadripleggie-expation: Guerison complete. Rev Neurol 1934;2:879-86. 8. Bremer JL. Dorsal intestinal fistula; accessory neurenteric canal; diastematomyelia. AMA Arch Pathol 1952;54:132-8. 9. Menezes AH, Traynelis VC. Spinal neurenteric cysts in the magnetic resonance imaging era. Neurosurgery 2006;58:97-105. 10. Small JM. Pre-axial enterogenous cysts. J Neurol Neurosurg Psychiatry 1962;25:184. 11. Bejjani GK, Wright DC, Schessel D, Sekhar LN. Endodermal cysts of the posterior fossa. Report of three cases and review of the literature. J Neurosurg 1998;89:326-35. 12. Preece MT, Osborn AG, Chin SS, Smirniotopoulos JG. Intracranial neurenteric cysts: Imaging and pathology spectrum. AJNR Am J Neuroradiol 2006;27:1211-6. 13. Wilkins RH, Odom GL. Spinal intradural cysts. In: Vinken PJ, Bruyn GW, editors. Tumors of the Spinal Cord. Handbook of Clinical Neurology. Vol. 20. New York, NY: North Holland; 1976. p. 55-102. 14. Fujita T, Kayama T, Saito S, Yamakawa M, Nakai O. Immunohistochemical detection of tumor marker in recurrent clivus enterogenous cyst: Case report. Neurol Med Chir (Tokyo) 1997;37:479-82. 15. Chaynes P, Bousquet P, Sol JC, Delisle MB, Richaud J, Lagarrigue J. Recurrent intracranial neurenteric cysts. Acta Neurochir (Wien) 1998;140:905-11. 16. Dunham CP, Curry B, Hamilton M. Malignant transformation of an intraaxial-supratentorial neurenteric cyst-Case report and review of the literature. Clin Neuropathol 2009;28:460-6.